Last Sunday I went in search of a healthy kitchen; Carrots – Bangalore’s first and only vegan restaurant. So far most of my pursuits have been in search of taste alone. Every restaurant that you see around is keen on fulfilling popular demand and generating higher revenue. Here is a restaurant and a restaurateur, that really cares not just about the taste of the food or its appearance, but about what it does to the consumer’s body and to the environment. Carrots doesn’t just make tall claims, but adheres to its philosophy to a T. I had the privilege of talking to Krishna Sashtry who is one of the founders of this restaurant. He told me about his journey so far as a vegan. An ex-IT professional, his heart and mind had always been on becoming a “green entrepreneur.” He turned vegan at a time when he was not even aware of the existence of this term, though now there are many like him who have adapted this lifestyle as a conscious choice. Krishna Shastry is a veteran in veganism and has been a vegan for about 13 years now. Vegans are vegetarians who do not consume animal or dairy products such as milk, curd, cheese, ghee, and so on. Vegans feel that robbing a cow of its milk and separating the calf from its mother is cruelty. Not only that, the dairy industry indirectly promotes beef industry. Animal farming and non-vegetarian dietary habits is one of the biggest contributors to environmental pollution. For all these reasons, vegans choose to consume plant-based diet. 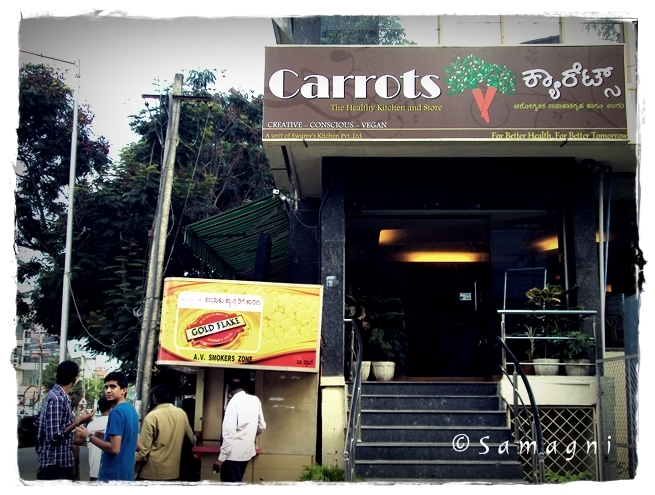 Carrots is located at 80 ft road, Koramangala 6th block. The restaurant ambience is very warm, pleasing, bright, and spacious. Sparingly furnished, the place can accommodate about 25-30 people at a time. Good enough setting for one to know what to expect. Since I reached the restaurant way past lunch time (more like 4 p.m.), most of the buffet lunch items were over. Yet I chose to eat the regular lunch buffet. I had lentil soup, ragi idlis served with sambar and chutney, and some brown rice with dal and tofu curry with zucchini. Mr. Shastry was kind enough to let me choose items from the broader menu to compensate for the lack of some buffet items. Regular buffet costs 399, fusion that includes pizza and pasta Rs. 499, and the special one Rs. 699. Weekday North Indian lunch thali costs Rs. 199. Mr. Shastry told me that the chef and his team at Carrots is still perfecting the taste of the South Indian thali. Take a look at the menu here. Along with veganism, Carrots also stands for organically cultivated ingredients and healthy diet. Mr. Shastry says that veganism, organic food, and health food are three different aspects that they try to bring together at Carrots. To illustrate, he says he could make Gobi Manchurian (which is a vegan dish) with organically cultivated cauliflower, but then it would mean using a few unhealthy ingredients such as maida, ajinomoto, etc. Carrots focuses on serving tasty food that does not harm the body. No maida is used; sparing use of oil and processed sugar. Cakes made of jowar flour, cookies made from bajra flour, chocolate mousse are just some of the desserts at Carrots. Chocolate mousse is made using cocoa powder, silken tofu, and jaggery, with almond shavings for garnish. I could not guess at all that no cow’s milk, egg, or sugar went into making it! I would rate it as a damn good chocolate mousse – vegan or not. Carrots also has a small store that houses organic products such as legumes, grains, spices, and cosmetic products. I bought a Kyra organic dishwashing powder and some hummus. A Vegan restaurant is a unique concept in Bangalore and in India; veganism itself being relatively new. As a culture, we promote the use of dairy and dairy products all across the nation. The cow is Kamadhenu and a holy symbol for us. We are eager to label it sacred but not bothered about what actually happens inside the dairy industry. The industry sells us products with cartoon labels of a very happy cow with a suckling calf in tow. This cartoon is far from the truth. Did you know that the cow is repeatedly impregnated most of its adult life and sent to slaughterhouses when milk production reduces? Not everybody needs to turn vegan or can turn vegan, but everyone can ask a question for sure. Scientific studies have proved that avoiding dairy can eliminate a lot of diseases and allergic conditions and that a plant-based diet is the best for human body. Most vegetarians in India are vegetarians by birth and not out of choice. More and more westerners are embracing vegetarianism and veganism by choice. This is highly commendable. We see the opposite happening back home. Meat industry has grown several folds in India. Households that used to consume meat once a week earlier now start their day with meat. Indian cuisine is filled with recipes that heavily use dairy products. Turning vegan seems like a difficult task but according to Mr. Shastry it is not difficult at all. He says although he still remembers the taste, he does not miss anything at all. Everything that uses dairy has an alternative vegan cooking method and the taste is almost the same. It just takes some time to get used to. Here is a wonderful blog that is a treasure house of vegan recipes. It is full of innovative recipes. This blogger, Susmitha, recently conducted a vegan baking class at Carrots. You can watch videos from the class at the blog link. Here is another Vegan blog that I have been following for a few years now by Harini Prakash who writes wonderfully and clicks amazingly beautiful photographs. Meeting Mr. Shastry and hearing about his philosophy restored my faith in humanity. This honest and humble man is doing a good service to the society by standing up for a cause and trying to spread awareness about conscious and healthy eating. He plans to use the space upstairs in his restaurant to conduct workshops and classes related to healthy living. Mr. Shastry says they are continuously innovating and revising their menu. I would suggest that along with pizzas, sandwiches, and pastas, he should consider adding varieties of sprouted whole grain dosas to the Carrots menu. A little bit of cold-pressed oil on the dosa wouldn’t hurt too. The choice can be the customers’. He could include more Indian vegan dishes, and also add some healthy small-eats and chaat items made of roasted grains (oil-free). A slightly more relaxed approach (concerning oil usage etc.) will attract more eager people to Carrots and help them discover the benefits of conscious and healthy vegan eating. Wishing Carrots and Mr. Shastry and his team all the very best. Very nice write-up and wonderful photographs! Really glad to know about Carrots and Mr. Shastry. All respect to the man for this wonderful venture. Let’s hope more and more people take inspiration from this and decide to lead, if not a vegan, at least a vegetarian lifestyle. Thanks Nisha. Yes, visiting Carrots has inspired me too. Thank you for the inspirational article. I am honored to hear that from you Nandita. I have immense respect for you and your work. The menu in Carrots is really a very UNIQUE concept and it is an excellent restaurant. Congrats to KRISHNA SHASTRY for pioneering such a great idea! Good article, and good suggestions for Carrots to implement too (especially the suggestion to include more Indian vegan dishes). Here “mutually exclusive” is used incorrectly. It does not fit in with what needs to be said. If they are mutually exclusive, then Carrots would definitely not be able to satisfy all these criteria! Please revise this statement. You can delete this comment. There’s no need to publish it unless you wish to debate further on this point. Absolutely Soujanya. Cant agree with you more.